This month’s composer is Nancy Telfer! Nancy Telfer is a Canadian composer from Bracebridge, Ontario. She studied piano, voice, composition and education at the University of Western Ontario. Ms. Telfer has composed over 350 works for orchestras, choirs, chamber ensembles, and soloists. I met Ms. Telfer at the Contemporary Showcase Festival held in Toronto, November 2018. This festival is sponsored by The Alliance for Canadian New Music Projects (ACNMP), an organization dedicated to promoting contemporary Canadian music. She was adjudicating junior and intermediate classes. It was a real treat for the performers as several of them played pieces by Nancy Telfer in front of Nancy Telfer! I appreciated her warm and inviting demeanor, and she always found something positive to encourage each performer. She also reassured the performers that it was okay to explore ways different ways of playing her pieces, that there was not only one way to play them. I first came across her pieces in the repertoire books from the Royal Conservatory of Music. Her pieces are favourites among my students. 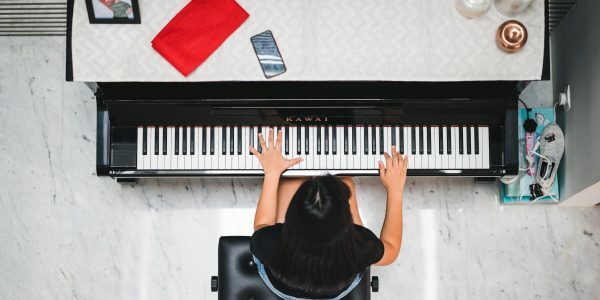 They often feature creative titles such as “When River Flowed on Mars” or “Halley’s Comet” or “Climb Up On An Elephant”, and inspire students to play musically. This piece looks intimidating because it has 5 flats in the key signature, but this just means that you only play on the black keys. As a result, you get the pentatonic scale, a collection of 5 notes that was developed independently by ancient civilizations around the world. Listen to how the piece starts slowly and softly in the mid-range of the piano, then grows louder and moves higher up the keyboard as the sun rises! Close your eyes and picture a peaceful lake in the still of the night, with clouds floating in the sky…finally, the moon peeks out and illuminates the quiet ripples. A hero sees the treasure; alas, there is a giant sleeping dragon in front of it! The hero begins to sneak around the slumbering dragon, but suddenly, the beast snorts and rolls over! Phew! It went back to sleep, and our hero sneaks out of the cave with the treasure! Shhh! This is found in the RCM Etudes book. All the solid chords look daunting, but this piece is a great way to apply theory knowledge by writing down the names of the chords. Now, it’s not quite that scary and is relatively easy to learn! Nancy Telfer is real Canadian treasure, and I look forward to exploring more of her pieces.